There are many ways to reduce energy use at home. Some of them are easy and quick, and others are more involved. Let’s start with the easy stuff: bump up the thermostat a degree or two; turn off lights when leaving a room for more than five minutes; set hot water heater temp to 120 degrees; close window coverings (shades, drapes, blinds, etc.) during the day (especially in unused rooms); replace incandescent bulbs with LED bulbs; turn off the television when not in use; get rid of the old refrigerator in the garage; identify and eliminate vampire power sources; only run fans in occupied rooms; use vacation settings on water heater and HVAC when you’re out of town. Once you have challenged the family with these simple steps, and they‘re on board, it might be time to explore more significant ways to save. I recommend a home energy assessment (or audit) before launching a serious energy-reduction quest at home. As a homeowner, you can do this with online guidelines, or you can bring in a professional who will generate a detailed report on ways to correct inefficiencies. If you have younger kids, this can be a fun game and learning experience: Have them go on a hunt for energy monsters, and explain the ways to tame the beast. While each home will have unique energy challenges, there are many that are quite common, particularly in homes built before the year 2000. While the focus here is on electricity and reducing its use around your home, I also have a few tips about other fuel sources. The home’s largest energy-zappers are typically found in the kitchen and utility room. The refrigerator, washer and dryer, hot water heater, and HVAC are the big four in most every home. There is some variance to location – if your home has baseboard heat for instance – but these appliances account for a large percentage of a home’s energy use. Let’s start with refrigerators. Check the seals around the doors to make sure they aren’t leaking, and replace if necessary. Turn up the temp so it keeps food just cold enough; even a degree or two makes a big difference in how hard it works. When it’s time to replace an old fridge, purchase an EnergyStar-certified new unit and dispose of the old one. Many people like to put their old fridge in the garage for extra storage. I strongly encourage homeowners to examine their needs and purchase a drink fridge or chest freezer to meet your needs more specifically. It might be costing you hundreds of dollars a year to keep an old unit in an unconditioned space that only has a few drinks, popsicles, or some frozen food in it. When it’s time for a new washing machine, choose an EnergyStar-rated model that senses how much water is needed for each load. Also, try washing most of your laundry in cold water. At our house, we wash very few things with warm water, and rarely use the hot water setting. Today’s detergents have been reformulated to work best in water 60 to 75 degrees, and stains come out best in cooler water also. The rinse cycle can always be cold water, as this has no effect on cleaning the clothes. The dryer is another energy monster, so spending a little more money to get an EnergyStar or energy-smart unit will save a lot of energy over its lifetime. A relatively easy task to help with dryer efficiency is to clean the exhaust hose and vent pipe twice a year. By removing lint buildup regularly, the air flows better and your clothes dry faster. Adjusting the temperature of your hot water heater will also save a significant amount of energy in the long run. A recommended setting of 120 degrees makes for a comfortable shower, while not overheating the water. If you need a new water heater, and your residence has natural gas, you should investigate a tankless water heater. While the initial cost to go tankless is typically more than a tank-style heater, the long-term benefits and energy savings are substantial. If you have a tanked system, make sure it is insulated with a tank blanket. HVAC (heating, ventilation, and air conditioning) is a large energy consumer, but oh-so necessary for any family’s comfort. There are many different kinds of systems and fuel sources, so I won’t go into much detail, but there are a few general topics to cover. One very common energy-zapper for HVAC is duct leakage. In most homes, more than 30 percent of the conditioned air that is created never reaches its destination inside the home. To reduce this air loss, use mastic sealant on all the ductwork. Also, have an HVAC professional eliminate or repair bad duct connections. To expand on the quick point mentioned earlier: A few degrees of change – warmer in summer, cooler in winter – makes a big difference in your heating and cooling energy use. Installing a programmable thermostat also makes temperature changes easy and consistent for the family. You can make the home cooler when everyone is home and active, then warm it up slightly at night or when it’s empty. While individual tastes will vary, the EPA recommends seventy-eight degrees for summertime and around sixty-eight for the winter months. Our house, a tri-level on one zone, tends to be best for everyone around seventy-five in the summer. In the end, of course, it’s important to find the balance for your family. 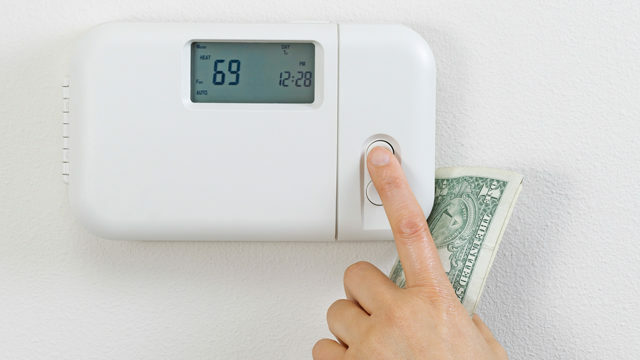 Living comfortably is what matters most, but saving energy (and money!) will add to your family’s comfort in the long run. You can get busy doing that today. Just reread the first paragraph, and tick through the suggestions on that easy list! Because I can’t resist, here are six more substantial projects to put on your list. These should show significant energy reduction at home over the course of a year. 1. Low-flow, not low-pressure. Install low-flow faucets on sinks and showers, plus install dual-flush commodes when replacing. 2. Caulk is your best friend. Find and fill air gaps around windows, doors, and other wall penetrations, like vets, cable lines, and spigots. 3. Insulate your older home. Add insulation as needed in attic and crawl space. If your attic joists are showing, you can probably use more insulation. 4. Your chimney is a big hole in the house. When not in use, stuff a black plastic bag full of insulation into the chimney opening to cut down on drafts. 6. Adapt a lifestyle for your family that prioritizes energy savings. Live by example, and share with your friends and kids why you do what you do. Tim Dunkum is an EarthCraft certified Realtor with Rashkind Saunders & Co. He has the National Association of Realtors’ GREEN designation and a background in residential construction. Tim and Sarah are raising their family to respect the earth and live with less impact.